Using modulated rectangular waves of different time periods, the circuit presented here produces ringing tones similar to those produced by a telephone. The circuit requires four astable multivibrators for its working. Therefore two 556 ICs are used here. The IC 556 contains two timers (similar to 555 ICs) in a single package. One can also assemble this circuit using four separate 555 ICs. The first multivibrator produces a rectangular waveform with 1-second ‘low’ duration and 2-second ‘high’ duration. This waveform is used to control the next multivibrator that produces another rectangular waveform. A resistor R7 is used at the collector of transistor T2 to prevent capacitor C3 from fully discharging when transistor T2 is conducting. Preset VR1 must be set at such a value that two ringing tones are heard in the loudspeaker in one second. The remaining two multivibrators are used to produce ringing tones corresponding to the ringing pulses produced by the preceding multivibrator stages. When switch S1 is closed, transistor T1 cuts off and thus the first multivibrator starts generating pulses. If this switch is placed in the power supply path, one has to wait for a longer time for the ringing to start after the switch is closed. 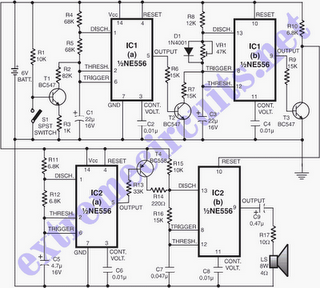 The circuit used also has a provision for applying a drive voltage to the circuit to start the ringing. Note that the circuit is not meant for connection to the telephone lines. Using appropriate drive circuitry at the input (across switch S1) one can use this circuit with intercoms, etc. Since ringing pulses are generated within the circuit, only a constant voltage is to be sent to the called party for ringing. To resemble the actual telephone ringing a 400 Hz tone is switched on in the following sequence: 400ms on, 200ms off, 400ms on and 2000ms off and then repeat.